Former Asante Kotoko defender, Abeiku Ainooson has thrown his weight behind his former employers as they engage Serbian side FK Jagodina in an anniversary cup match at the Baba Yara Sports Stadium in Kumasi on Sunday. The game which directly forms part of Asante Kotoko’s preparation for the upcoming season as their in-depth quality will be tested by the Serbian outfit who are yet to arrive in Ghana because of bad weather in Turkey. But the organizers of the game, Pacific Football Ghana Limited have assured the general public that the scheduled anniversary game will definitely come off as they have put proper measures to transport FK Jogodina team to Kumasi regardless of the time they will touched down in Ghana. But Abeiku Ainooson who left Kotoko to Sudanese side Al Hilal in November 2015 has wished his former employers well ahead of the Sunday’s game against their Serbian counterparts. 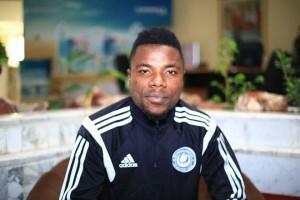 “Wishing you all the best in tomorrow’s game against Jagodina,” Abeiku wrote on his facebook page. Ainooson joined Asante Kotoko last two seasons from New Edubiase and won the 2014 FA Cup Best Defender as well as the Premier League Best Defender during his stint with the Porcupine Warriors.